By the time they got to college, the brothers were reading books about bridge and “taking it very seriously,” says Dennis, who is a year older than Jerry. The two began playing tournament bridge together over 35 years ago and have never looked back. 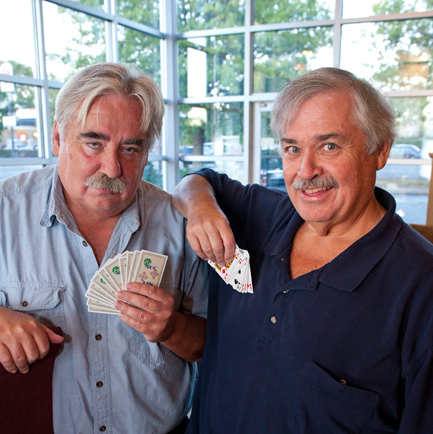 Those years of experience paid off in July 2010 when the Clerkin brothers, both Bloomington residents, won the American Contract Bridge League’s Grand National Teams Championship in New Orleans, a tournament in which they played 320 hands over five days. When they aren’t playing in tournaments the brothers teach bridge locally and, thanks to the Internet, play online. “People all over the world play online,” says Jerry, recalling recent opponents from Turkey, Israel, and Portugal. The brothers spend 15 to 18 weeks on the road every year. They’ve traveled to Europe half a dozen times and frequently to Mexico and Canada. In October, the Clerkins will be in Philadelphia for the world bridge championship, which will take place over 17 days. Dennis, looks just like I remember his dad John Billie Clerkin. He was my God father. I would like to be able to e-mail Dennis if possible . I played in the game at the union from 56-60. Were you two playing then?